2011-12 was an up and down season as a strong squad showed early promise with an 11-game winning run and a number of cup runs, but two enforced changes of management ultimately robbed Vale of consistency and another brush with relegation ensued before they made certain of their Premier Division place for next season. The summer saw the departures of midfielder Kerr Dodds to Spartans, Paul Doohan to Edinburgh University, Darren Gillon to Newtongrange Star and Andy Milligan to Craigroyston. Goalkeeper Darren Walker and defender John Hall joined up with former Vale boss Rab Paget, who had taken on the manager’s job at Whitehill Welfare towards the end of the previous season, while also departing was Graeme Cole. To fill the void, manager Robbie Horn made a clutch of signings – local goalkeeper Mark Wilson returned from a season in the Border Amateur League with Leithen Rovers to compete for the number one jersey with former Newtongrange Star stopper Chris Hill. Defenders Stephen Sproule and Ryan McKenzie arrived from assistant manager Jamie Burrell’s former club Craigroyston, creative midfielders Jordan Hall and Scott Devlin joined up from Whitehill Welfare and Bonnyrigg Rose respectively and versatile former Lothian Thistle player Jamie Paterson, who could operate in defence and midfield was another newcomer. Teenage striker John Ferguson was signed on loan from SFL club Cowdenbeath and Horn also brought in his former Berwick Rangers team mate Grant McNicoll from Newtongrange Star. In the dugout, goalkeeping coach David McGinley also departed to link up with Paget at Rosewell, while coach Stuart Gray accepted a position coaching youths at Spartans and was replaced by former Newtongrange Star coach Colin Affleck. Pre-season, Victoria Park hosted two visits from SPL sides, the first against a Heart of Midlothian XI. As Hearts manager Jim Jeffries looked on, Nigerian trialist Ortega Deniran capitalised on a defensive mix-up to give the lead to the capital side, whose team was mainly made up of U-19 players. The second half saw a tremendous fightback from Vale, with Scott Moffat equalising with a diving header three minutes after the restart and in the 77th minute striker Steve Radzynski turned to hammer a low shot home from 20 yards, which proved to be the winner and handed Vale a major confidence booster. Junior sides provided the opposition for the next three pre-season games, Vale overcoming Bonnyrigg Rose at home, losing to Newtongrange Star away and the journey up to Tayside to meet regular pre-season opponents Kirriemuir Thistle resulted in a comfortable 2-0 victory for Vale. The final pre-season game was back at Victoria Park as Hibernian U-19s were the visitors. Vale were on the back foot for most of the game against an impressive young Hibs side who asked some serious questions of the defence, but only one goal, scored by Danny Handling, separated the sides at the final whistle. There were some changes in the East of Scotland scene as Hutchison Vale Community Club, who had tried unsuccessfully to gain membership of the East of Scotland League on a couple of previous occasions, formalised links with Lothian Thistle and the club became known as Lothian Thistle Hutchison Vale. Also coming into the set-up was Berwickshire club Duns, which meant the First Division now comprised 13 teams. The most significant development though, was the creation of a new competition to kick the season off. The League Cup sections – which had been abandoned in favour of a straight knock-out competition the previous year – had proved unpopular with sides still trying to finalise their squads as the season started, as rules required only signed players could play in cup competitions. The League therefore voted to create a separate competition called the East of Scotland Qualifying League in which teams were permitted to play trialists. The format consisted of four sections of six teams playing each other once, with the top two from each section qualifying for an abridged League Cup to be played later in the season. The new competition proved a huge success as fans were treated to some exciting games to kick off the season. Vale started with a home game against Spartans, who were two goals up at half time through Jack Beesley and Scott Fusco, but a Scott Devlin penalty and a Ali McKinnon own goal in the second half rescued a point for Vale. Vale shot themselves in the foot in a midweek game against First Division Craigroyston in Edinburgh. Scott Moffat scored an early goal and Craigie goalkeeper Stuart Addison found his goal under siege as Vale pounded it for the rest of the first half, but couldn’t add to their lead. The game changed in the second half when Jamie Paterson was red-carded for an off the ball incident and Craigroyston, who featured former Vale players Andy Milligan, Mike Stewart, Rory Stewart and Darren Lockhart in their line up, took control of what was becoming a bad-tempered game and a deflected Jamie Stewart free kick spun out of the grasp of Chris Hill and in before a goal in the last minute from Stephen Mullen won it for Craigroyston. It was a disappointing result and an early chance to make amends was dashed as the season’s first postponement saw the game at home to Leith Athletic called off due to heavy rain. But the next game resulted in a 6-0 demolition of Kelso United and sparked off a superb 11-game winning run for the Innerleithen side. A Steve Radzynski hat-trick secured victory at Easthouses to put Vale in a strong position to finish in the top two of the section and Vale started their Premier Division campaign in style as Sellkirk were defeated 4-0 at Victoria Park – a match that saw captain Paul Lee celebrate his 100th appearance for the club with a rare goal. It was six points out of six as Vale defeated Civil Service Strollers 5-1 at Muirhouse, with Scott Devlin achieving that rarest of footballing feats as he blasted home a hat trick from the penalty spot. Kelso United were the visitors in the Image Printers East of Scotland Qualifying Cup First Round, but it was much tighter game than the Qualifying League encounter a week and a half earlier. A penalty from Scott Devlin put Vale in the lead, but an own goal by Grant McNicoll put the Tweedsiders level before Jordan Hall notched what proved to be the winner. That wasn’t the end of the action as Vale were awarded another penalty late in the game as keeper David Simmmons was red-carded for pulling down David Anderson in the area. Striker Des Burnett pulled on the gloves to save Scott Devlin’s second strike from the spot and Kelso were reduced to nine as John McCutcheon received a second booking. The Second Round was another Border derby as Peebles Rovers were the visitors and it was another hard game for Vale. Rain had left the Victoria Park pitch in a perilous state, with match referee Scott Jamieson taking a hard look at conditions after a goalless first half before deciding to let the second period go ahead. Peebles took the lead on the hour mark through Andrew Williamson, but Vale equalised within five minutes as Scott Moffat side-footed an Andy Martin cross home. Four minutes from time Steve Radzynski turned his marker beautifully to square for John Ferguson to fire the ball into the net. A chance arrived for Peebles to take the game into extra time in the final seconds as a rebound fell to Michael Holness, but the midfielder lost his footing on the slippery surface at the vital moment and his shot flew wide. The First Round of the William Hill Scottish Cup handed Vale a home tie against former South of Scotland League, now West Region Junior side, Girvan. It was the first time the clubs had met in almost two decades and a Scott Moffat goal in the 25th minute was enough for Vale to edge a tight game and secure a place in the Second Round. Vale’s winning run continued as they beat Leith Athletic 2-1 at home in the rearranged East of Scotland Qualifying League match. It meant three teams tied at the top of the group on ten points, but goal difference meant Vale were top and Spartans also qualified for the League Cup Quarter Finals in second place ahead of unlucky Easthouses Lily. A 2-1 win against Edinburgh University at Peffermill also saw Vale book a place in the Semi Finals of the Image Printers Cup and a 4-2 win at Riccarton over Heriot-Watt University meant Vale were into the Third Round of the South Region Challenge Cup. The Second Round of the Scottish Cup handed Vale a home draw against Highland League side Cove Rangers and proved to be one of the most dramatic Scottish Cup ties ever witnessed at Victoria Park. Despite being very much the underdogs, goals from Scott Moffat and Jordan Hall, both supplied by some great play from Andy Martin, saw Vale race into a two-goal lead. Richie Singer pulled one back for Cove in first half injury time, but it looked like Vale had withstood the visitors second half onslaught as the final whistle neared. In the final minute of normal time, Cove’s Jordan Leydon had a shot brilliantly blocked by keeper Mark Wilson, but substitute Kevin Webster was following up and smashed the ball home. A minute later, Cove nearly found a winner as Leydon shot wide from a great position, but in the fifth minute of injury time, Martin slipped a ball through to John Ferguson who calmly placed a shot high into the net to spark wild celebrations. John Ferguson nets the winner against Cove Rangers in the fifth minute of injury time. The next game was a Premier Division game against Whitehill Welfare, but Vale lost 4-1 at Rosewell to bring their winning run to an end. Seven days later the two sides met again in the Image Printers Cup Semi Final in Innerleithen and it was a much closer game, with Vale arguably having the better of the play, but ex-Vale striker Aaron Somerville headed an opener for Whitehill to give them a half time lead and although Steve Radzynski equalised early in the second half, another goal from Somerville saw Whitehill reach the final. Two defeats, plus a postponement as the South Region Challenge Cup game against Selkirk fell victim to the weather, was not the ideal preparation for Vale’s Third Round Scottish Cup tie against Scottish Junior Cup holders Auchinleck Talbot. Another blow on the day saw goal hero of the last round John Ferguson withdrawing from the squad due to injury. But Vale still travelled west in good spirits with an otherwise full squad to choose from. Once again the Innerleithen men were in the role of underdogs against one of the best non-league sides in the country, but a crowd of around 800 saw Vale sensationally take the lead in the 25th minute when Liam McKenna, a midfielder who had signed on a short term loan deal from Newtongrange Star and was making his first start for the club, got on the end of a Jordan Hall corner to send a shot flying into the net. But Keir Milliken grabbed an equaliser just before half time and Michael McCann put the home side ahead a few minutes into the second half. There was further agony for Vale as an Andy Martin piledriver from 20 yards came crashing back off the bar, before Bryan Young added a third for Talbot, allowing them to close the game down and see out the remaining time. Auchenleck were rewarded with a trip to Tynecastle to face SPL side Heart of Midlothian in the Fourth Round, and although they put up a superb performance, the SPL side squeaked through 1-0. Vale keeper Mark Wilson feels the force of a challenge by Auchenleck Talbot’s Michael McCann (above left) in the Scottish Cup tie at Beechwood Park, while (above right) the Vale bench look on. Weather conditions during December meant that only one game was played all month – a South Region Challenge Cup Third Round tie against Selkirk. Already postponed twice, the clubs agreed to play the game at the all-weather surface at Polton Hall in Midlothian. In sub-zero conditions with the players and a small band of hardy spectators battered throughout by freezing wind and rain showers, Selkirk, rooted to the foot of the table and under new manager Mick McKinnon, were only able to muster 10 players for the game due to injuries and suspensions and Vale ran out comfortable winners. As 2011 drew to a close, the club was saddened by the news of the deaths of two men well known to the club. Peebles Rovers match secretary Maurice Gordon, a well known figure in East of Scotland football circles for the previous thirty years, died suddenly and former goalkeeper Robert Hodge also unexpectedly passed away at his home in Loanhead. Robert had been a Vale stalwart during the 70s, being part of the side that won the Scottish Qualifying Cup during season 1976-77 and also featured in the club’s most famous result in January 1978 when Forfar Athletic were beaten 4-1 in the Second Round of the Scottish Cup. With postponements and cup competitions taking up a lot of the available weekends, Vale began 2012 having played only three league fixtures – the lowest of any East of Scotland side. They managed their fourth on the first Saturday of the new year at Ainslie Park, but first half goals from Robbie Manson and Ali McKinnon saw Spartans claim the points. It was manager Robbie Horn’s 50th game in charge – his first ironically coming at the same venue the previous season – and it proved to be his last as he was approached by former club Berwick Rangers to become assistant to recently installed manager Ian Little at Shielfield Park. Assistant manager Jamie Burrell was promoted to the hot seat and his first match in charge was an incident-packed league game against Tynecastle at Fernieside. John Ferguson headed an opener for Vale, but Jamie Lauder turned a Robbie Arthur cross into his own net to bring the score level at the break. Early in the second half, Tynecastle’s Ewan McIntosh was red-carded and shortly afterward another Ferguson goal put Vale ahead. But Arthur drew Tynecastle level again, who were reduced to nine men when Eddie Mearns picked up his second booking. Vale were now obvious favourites to win, but the home side astonishingly took the lead for the first time in the game after a penalty was awarded for a push on Darren Aird by Ryan McKenzie, with McKenzie sent off for the foul and Arthur converting from the spot. Tynecastle packed their defence out and seemed to have held Vale off until Ferguson was brought down in the area by Kevin Morrison in the third minute of extra time and Jordan Hall found the net from the spot to give Vale a share of the spoils. The next match at home to Lothian Thistle Hutchison Vale saw Alan McDonaugh give the visitors the lead in the first half, but a strong finish by Vale saw goals from Scott Devlin and Jamie Paterson in the final three minutes hand Vale a win. The South Region Challenge Cup Third Round saw Vale entertain Threave Rovers. The former East of Scotland side, who had returned to the South of Scotland League eight years previously, had gathered a deserved reputation for causing upsets at the homes of their former league rivals and so it was the case when they visited Victoria Park. In a game of numerous chances for both sides it was something of a surprise that the first 45 minutes ended with the scoreline blank, but just past the hour mark Steve Radzynski got on the end of a Andy Martin cross to nod Vale in front. However, with ten minutes remaining, Andrew Donnelly blasted an equaliser from a Sam Warren corner and three minutes later another ball into the box by Warren was cleared by Vale keeper Chris Hill only as far as Donnelly and the striker fired home to send the Castle Douglas side into the Semi Finals. Two league meetings in three days against Edinburgh City saw a midweek loss at Meadowbank and a weekend win at Victoria Park. On the player front, John Ferguson’s loan deal expired and although Vale had hopes of keeping the striker, he followed Robbie Horn to Berwick Rangers. Also departing were goalkeepers Mark Wilson and Chris Hill, while Grant McNicoll had been ruled out for the rest of the season with a knee injury. Coming in to boost the squad for the remainder of the season were former Craigroyston and Easthouses Lily goalkeeper Craig Weir, defender Steven Robertson from Whitehill Welfare, midfielder Ross Gaylor from Easthouses Lily, strikers James Binnie from Craigroyston and Wayne Sproule from Whitehill Welfare. Although March started with a penalty shoot-out victory against Kelso United in the King Cup after 120 minutes had failed to produce a goal, it was a miserable month. Vale exited the Central Taxis League Cup at Rosewell after a 6-3 loss. Whitehill – now minus manager Rab Paget but still with ex-Vale players Darren Walker, John Hall, Aaron Somerville and Alex Munro in their team – were three up inside the first 20 minutes through Somerville, Wayne McIntosh and Mike Herd, who also missed a penalty. Vale sensationally drew level with two penalties from Jordan Hall and a Wayne Sproule strike, but a goal from Andrew Kidd, another from McIntosh and one from Scott Gormley made it a comprehensive win for Whitehill. League defeats followed in the return fixtures against Lothian Thistle Hutchison Vale and Tynecastle and another league loss followed at Stirling University, before yet another cup exit at the hands of Whitehill saw Vale’s interest in the King Cup ended. Discipline was becoming a real problem, with red cards being shown to Vale players with alarming frequency and a huge number of bookings issued, mainly for dissent. A double-header against Edinburgh University was the last straw for manager Jamie Burrell. A loss at home was followed three days later by a 3-0 defeat at Peffermill against what was a second string side as ‘Burgh saved their first team players for a match in the Queen’s Park Shield 24 hours later and Burrell resigned immediately after the final whistle, with assistant Colin Affleck departing as well. With the manager’s chair empty again, Vale drafted in former Lothian Thistle boss Fraser Ogilvie to take charge alongside former player Kerr Dodds, who had picked up an injury playing for Spartans in the first game of the year against Vale which had ruled him out for the rest of the season. While Dodds negotiated his release from the Edinburgh club, Ogilvie took sole charge of the team for his first game, ironically against Spartans. With only one training session with his new charges behind him, Paul Lee and Jamie Paterson missing through suspension, James Binnie, Ryan McKenzie, Stephen Sproule, Chris Beaton and Ross Gaylor all unavailable and a Spartans side gunning for the retention of their title with Stirling University breathing down their necks, it was by no means an ideal situation for the new gaffer. But right from kick off Vale looked like a different side to the one that had spent the last couple of months underperforming and although Gavin Malin gave Spartans the lead early in the second half, Vale came storming back and Scott Moffat equalised on the hour mark before Scott Devlin shot home a superb free kick five minutes from time to shock the defending champions and throw the title race wide open. The result lifted Vale three points clear of the relegation zone, while it left Spartans depending on Stirling University to slip up somewhere. But Vale sank back into dangerous territory following a game against an improving Leith Athletic at Muirhouse. Vale had to play three quarters of the match with ten men as Ryan McKenzie was sent off and two late goals from Leith cancelled out Ricky Miller’s first half opener. The league fixture at Gretna saw the home side forced to field a severely depleted team due to injuries, suspensions and unavailability and Vale grabbed the opportunity to boost their goal difference with a 9-1 win. 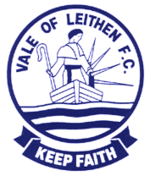 A 4-0 win against already relegated Selkirk saw Vale take another huge step towards safety before they confirmed their Premier Division status for another season when a first half goal from Wayne Sproule was enough to defeat Leith Athletic at Victoria Park. There was one more issue to be settled in the Premier Division – that of champions. Spartans faced Whitehill Welfare while Stirling University were the visitors to Innerleithen for the games that would decide the destination of the trophy. Both games were scheduled to take place at the same time on Friday 18th May, but heavy rain postponed the game at Innerleithen and it went ahead on the Monday. With Spartans having edged a thrilling game 5-4 at Rosewell on the Friday, Stirling went into the final game knowing that a victory of at least two goals would secure the title. An early goal by Jordan Hall silenced the large visiting support, but a Chris Geddes penalty drew them level, and further goals from Geddes and Daniel Denholm had established the required two-goal margin by half time. But Stirling weren’t finished and proceeded to rattle another four past Vale in the second half, with Liam Corr, Creag Robertson, Geddes and Eddie Dines finding the target. It meant delight for Stirling as they celebrated their first East of Scotland League championship, but was a sobering end of the season for Vale. Despite the ups and downs of the season, there was no shortage of candidates for the Player of the Year awards and Players Player of the Year went to Scott Moffat, who was also top scorer. Supporters Player of the Year was Ricky Miller after some outstanding displays in defence, while both President’s and Manager’s Player of the Year went to Paul Greenhill, who had been unlucky to have been overlooked for awards in the previous couple of seasons. A special award of Life Membership of the club was also handed to Innerleithen’s Walter Walker, in recognition of his unstinting support of the club for over 70 years. The end of the season also saw club Chairman Ken Brown resign his position as he moved abroad to work. A presentation was made to him at the club’s annual Sportsman’s Dinner in recognition of the outstanding work he had put in over the previous 18 years. Players of the Year (l to r), Paul Greenhill, Ricky Miller and Scott Moffat. Vale’s Drew Blair presents Innerleithen’s Walter Walker with Life Membership of the club.